Founded in 1981, the Ohara School of Ikebana, La Jolla Chapter is a non-profit, local organization for instructors and student of the Ohara School to exchange cultural ideas and keep informed of the latest development of the Ohara School of Ikebana. Members meet for workshops, meetings, exhibitions, and other various social events. The Coming of Age Ceremony (Japanese: "Seijin-shiki") is an important rite of passage for many young Japanese adults in Japan, just turning twenty. Many of them attend a ceremony at their local community center, dressed in traditional kimono or western suits to celebrate the new chapter in their lives. Unmarried women have the chance to wear the elaborate long-sleeved kimono called furisode. Families and friends will take many photos together on this occasion. Celebrate the holidays with us at our Winter Membership Breakfast! We will provide a small breakfast, refreshments, fun activities, and more. JFG members and guests of all ages are invited, so bring your friends and families too! Join us for this fun event on December 16th at 8-10 AM at the Inamori Pavillion in the JFG. If life is a nightmare, wake up to a dream. Learn some simple daily habits that can lift an ordinary life to one that is in harmony with reality. Shichi-Go-San (Seven-Five-Three) is traditionally observed on November 15 in Japan. It is the day when girls who are three and seven years old and boys who are three and five are dressed in their finest clothes and taken by their parents to the nearby shrines to pray for their healthy growth and good health. Join us and our friends from the San Diego Bonsai Club (SDBC) for an introductory class to bonsai! This class will be lead by visiting bonsai teacher Jason Chan who has studied under bonsai master, David Nguy in Los Angeles. Nourish your soul and uplift your spirits during this healing, rejuvenating ceremony and celebration. The evening will include a walking meditation in the gorgeous Japanese Friendship Garden, a healing guided visualization, inspiring music, and a heart-opening ceremony of gratitude honoring the beauty and abundance of Autumn. The Urasenke San Diego Association will hold its autumn tea ceremony class beginning February 25. Learn about the history of the tea ceremony, tea drinking etiquette, and how to properly use fukusa linen and sensu fans during a tea ceremony! Join an exciting and dynamic music program at the JFG!! !JFG is initiating a taiko team for middle school children, led by Genbu Daiko Ensemble Master Instructor Noel Garcia. Noel Garcia brings twenty years of professional taiko teaching experience to build his students into performance-level musicians. Regardless of prior experience, all participants will train to perform a full pieces of music to be performed at JFG festivals and private events. for the NIWA Award for Outstanding Community Leadership. JFG opens its third annual taiko camp, taught by Genbu Daiko Ensemble Master Instructor Noel Garcia. This intense five day morning camp for middle school children is a great introduction to the world of taiko. Visit this page regularly for the latest updates for our Obon Festival! Come get spirited away at our Japanese Pop Culture Party! This year, the super natural will be taking over our Inamori Pavilion on July 21st! The evening will be accompanied by food and activity booths run by yokai, a live DJ and performances, and a super natural costume contest! Summer camp season is back again! Join the Japanese Friendship Garden for another fun week immersed in Japanese culture. This year, summer camp participants will experience hands on activities ranging from garden aesthetics, basic botany, flower arrangements, dance, music, storytelling, language, games, sushi rolls, candy sushi, painting, manga art, taiko drums, yukata, and more! Experience the thrill of a Kyoto garden visit experience right here in Balboa Park, San Diego! The Japanese Friendship Garden is teaming up with longtime partner Yuko Niwa to provide a new yukata and kimono rental service at the Japanese Friendship Garden Activity Center. Visitors and members alike can enjoy strolling around the garden in true Japanese style. A San Diego based private healing practice. Shamanic Soul Center serves individual clients through Personalized Healing Sessions incorporating Reiki, Shamanic Healing and Intuitive Guidance. It also offers groups events, classes, workshops, facilitation of ceremonies and distance healings. The evening will include a walking meditation through the garden, a healing guided visualization, a ceremony of gratitude, and teachings on the significance of the summer solstice and how we can make best use of the powerful energies of this time of transition. 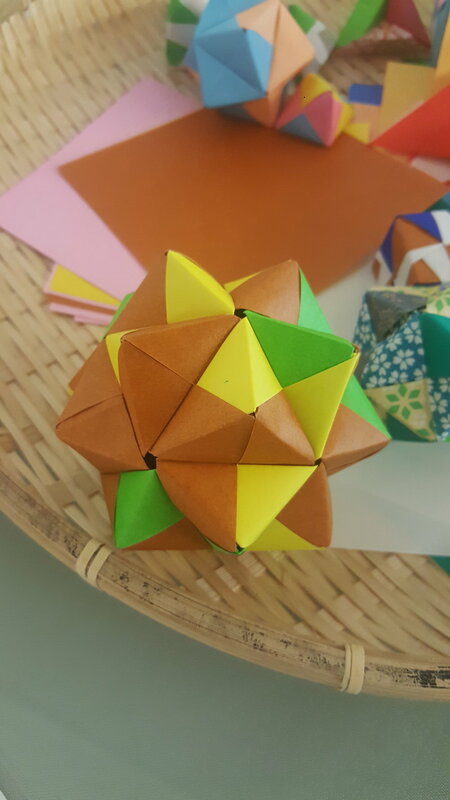 Working in partnership with the Japanese Friendship Garden, Momentum Learning and The AjA Project implemented a series of workshops that introduced students to the art of origami and photography with an emphasis on the use of abstraction and symbolism. On December 16, 2016, participants visited the Japanese Friendship Garden for a photographic field trip where they captured the colors, patterns and textures of the garden to symbolically represent aspects of their identity. With the AjA Project's new exhibition, "Reflect | Unfold", opening in the Inamori Pavilion, we will be offering guests to make their own sonobe! When you purchase admission to "Reflect | Unfold" during the dates below, you'll be able to participate in a sonobe making class! See below for dates and time for upcoming classes. Each class is held from 1:00 PM- 3:00 PM. For one night only, Sonic IMPACT will be performing at the Inamori Pavilion! This special event is FREE with JFG admission. "By celebrating culture, Sonic Impact transforms musicians and listeners into cultural ambassadors, empowering them to become leaders in the intercultural conversation that alone can plow through the deadlock, reopening vital communication channels via a language of inclusion, connecting us at the most intimate level." Balboa Park After Dark is a new program which will run from May 26 through September 1 (Memorial Day weekend to Labor Day weekend). By further activating Balboa Park with extended hours at the museums, in conjunction with Food Truck Fridays, and public entertainment, we hope to make Balboa Park even more of a nighttime destination for locals and visitors. Children’s day is a national Japanese holiday celebrated on May 5th. Traditionally, this day was known as Boys Day and was set aside to honor fathers and sons, much as Girls Day on March 3 celebrates mothers and daughters. Koinobori means “carp streamer” and they represent the fish in many different colors. They are traditionally flown in Japan in celebration of Kodomo no Hi, or Children’s day since carp are considered the most spirited fish who fight their way upstream using their strength and determination, overcoming all obstacles in their path. Membership has its privileges! The Big Exchange gives members of participating organizations reciprocal admission at 35 museums, historic sites, gardens, and more throughout San Diego County during the month of May! Come and witness the spectacular EDO MARIONETTE GROUP (江戸糸あやつり人形劇場団）on tour at the Japanese Friendship Garden in San Diego on Sunday, April 30, 2017! The Edo Marionette Group presents and preserves fine and sophisticated marionettes from the 17th century with performances of "Kappore", "Yoidore--A Drunkard", "Kurokami--Black Hair", and "Shishimai--Lion Dance"
The Japanese Friendship Garden Society of San Diego will be hosting the 8th Annual Membership Tea for our loyal members.This year we are proud to host the event in our beautiful Inamori Pavilion. Come join us for a morning of tea, light refreshments, and fun-filled activites. From March 10-12, enjoy the Japanese custom of hanami - appreciating the beauty of cherry blossom flowers! Each day will also be accompanied by various food vendors, cultural performances and demonstrations, and a plethora of family friendly activities! Co-hosted by Azunakai and the Japanese Friendship Garden. This year JFG hosts its second international Coming of Age Ceremony. Students from all cultures and backgrounds are highly encouraged to attend this event. When possible, please wear the traditional clothes of your culture to represent it and bring an exciting dynamic to the event. Kimono and hair dressing is available (sold in separate packages). Please arrive at least one or two hours prior to event and schedule an appointment with kimono dresser Yuko Niwa at yukoniwa@gmail.com or 858.752.2206. Kimono rentals start at $65 for the first six students and $70 thereafter. Participant Entry $15 - (includes full access to the garden, Inamori Pavilion, the ceremony, refreshments, and professional photographs. $15 Participant fee is waived upon purchase of 3 or more $25 guest entries. Please enter the discount code "2017" when prompted to take advantage of this discount. In addition, please send at least three of your childhood photos to be shown on a possible slideshow at the ceremony. Kimono Rental Starting from $65 (sold separately) - Kimono rentals are arranged separately through Yuko Niwa at a bargain price. For participants bringing their own kimono and wished to be dressed, there is a $25 fee. Please contact Yuko at yukoniwa@gmail.com or 858.752.2206. Photos available upon request. Be sure to mention the Japanese Friendship Garden Coming of Age Ceremony to be eligible for this price. Read further conditions below. Professional grade exclusive photo session available only with $20! - Including 15 to 20 selected high quality photos, memorable DVD and the shipment. 1) Guest those who order kimono dressing: Please contact to Rental KimonoYUKO ( photo session could be scheduled as a part of Kimono dressing). 1. Kimono Rental is limited to 12 people (8 women and 4 men). Once all 12 kimonos are rented out, kimonos are available upon request but additional cost. 3. Please view the attached photos below of your kimono and make a request by email with the kimono description and number. 4. Please arrive at least one to five hours prior to event (9am - 1pm) and schedule an appointment with kimono dresser Yuko Niwa. The day of the ceremony students can enter the garden at the front entrance and change into their kimono at dressing rooms provided at the Inamori Pavilion in the lower garden. Separate parking and entry through the bottom garden can be arranged with prior notice and proof of registration. (CANCELLED) Create Your Own Custom Gingerbread Person! Vege-Stamps: Make your own stamps! Fee: Free with admission, but donations are greatly appreciated to help keep our programs going strong! Vege-Stamps, create your own stamps and holiday cards with sweet potatoes, okra, and lotus roots. This eco-friendly, creative, and fun gift will be the talk of your family event. Classes are free of charge and open to all. Donations gratefully accepted. (CANCELLED) Cooking with Kids: Holiday Special! We apologize for the inconvenience, but this class has been cancelled. Fee: Garden Members: $110 per child (10% sibling discount applies), $150 per adult. Non-Members: $120 per child (10% sibling discount applies), $160 per adult. Registration and details to come. In the meantime, contact JFG Program Coordinator Frederic Hewett at 619.232.2722 or at programs@niwa.org.